Road Runner Girl: Groovebook...the Grooviest Photo App! In this day and age almost everyone has a smartphone and is uploading pictures to Facebook, Twitter, and Instagram. C'mon! You know you do it! So when I discovered Groovebook I knew it was a must have app for me! And guess what? You are going to get to try it for FREE! So what exactly is Groovebook? It is a photo app that lets you upload 100 photos each month and they bound them into a 4.5" x 6.5" photo book and mail them to your home...for only $2.99 for shipping and processing! You can't beat that price! No photo center will print 100 photos for you at that price! I couldn't wait to get my first photo book! I picked several of my favorite photos from the past few months...including ones from several races I had done. I was so excited when my book arrived! The pictures are printed on glossy photo paper! Each page displays the date and time the picture was taken...this picture was taken while we were in line for the bus to take us to the Walt Disney World Marathon...at 3:42AM (says 2:42AM but we were an hour ahead of my time zone)! Each picture is also perforated so you can remove it easily from the book! This is perfect for pictures you want to share with someone, put in a frame, or scrapbook! I love this picture of me and my hubby! I tore it out of the book easily and am now displaying it in a frame in our living room! I upload a ton of pictures to Instagram so I was curious how they would turn out. They were awesome! Since Instagram crops your pictures into a square I was worried the pictures would be distorted or stretched to fill the space. Nope! They were just printed square! I even labeled the front of my Groovebook so I will easily know what pictures are inside...because I plan on getting a new one of these every month! I absolutely LOVE this app!!! It's an awesome way to get your photos in print at a very affordable price! And my boys LOVE looking at it! It's the perfect size for their little hands to hold and flip through! I can't wait to get my next Groovebook! Watch this quick video to see how easy Groovebook is! Are you ready to try Groovebook for FREE? All you need to do is download the app (available at the App Store for iPhone and Google Play for Android). You create your account and start uploading your photos. You will need a credit card to start your monthly subscription but you will get your first book for free if you use my promo code. Once you receive your book, if you don't like it, you can cancel at any time. There is no obligation or contract. 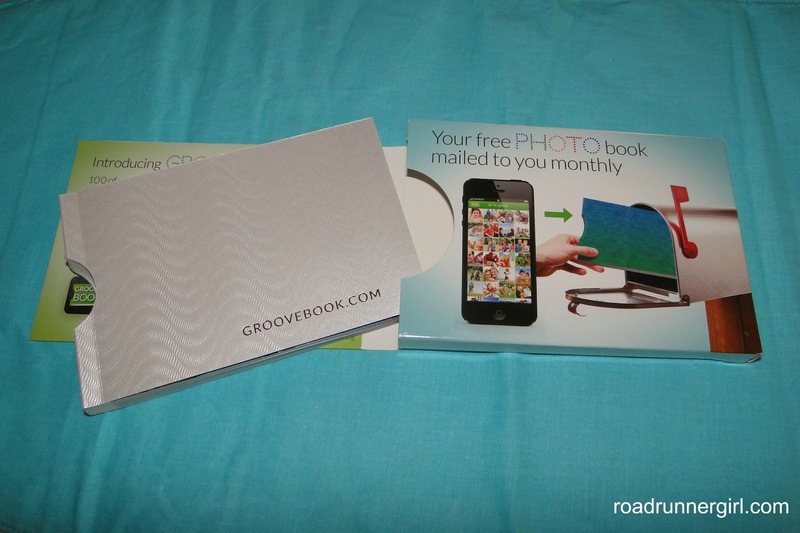 Use the promo code ROADRUNNERGIRL1 to get your first Groovebook free! You can also find Groovebook on Facebook, Twitter, and Pinterest! QOTD: Will you give Groovebook a try? Disclaimer: Groovebook sent me my first book free to review. I received no other compensation. All opinions in the above post are mine and mine alone!